Divisive angular UK post-punkers Savages have plenty to answer for and many to answer to. Admirers have praised their moral (or immoral) boldness, but crave more. Detractors think it's all empty posturing without backbone. Speaking to Exclaim!, singer Jehnny Beth cleared up some of the ambiguities in their ever-expanding manifesto, which spans from lyrical content to interview remarks to the prominent instructional poem that graces the cover of debut LP Silence Yourself. Her first point is that music, while somewhat limited, can be an incentive to better accumulate real-life experience. "I feel that experience is the key to everything," Beth posits. "You have to experience a lot of things, that's the only way you can explore things. That's why I really like hypnotherapy: the idea that you can train your mind to explore potentials, ideas and actions. When I was a kid, I was inexperienced, but my parents were intellectuals in a sense, so they would play me some films and make me read some books. So you have the knowledge, but not the body knowledge." Implying a rebuttal to those who rolled eyes at the violence-positive sentiment of "Hit Me" — on which the lyrics relate that "I took a beating tonight, and that was the best I ever had" — Beth believes that sexual activity, in certain circumstances, should exist outside normal moral parameters, such as the gender debate. "I think sexuality is a good place to explore some dark sides of yourself," she says. "If you like submission, for example, it's a good place to do it. It's a safe place to explore yourself. When you're naked, there's no danger in going into the darkest sides of yourself. And your strangest thoughts, and weirdest desires: they're all allowed and they're really safe. And to explore those kind of things, there's no other field apart from music." Beth goes on to detail how the band's modus operandi extends their musical ethos: "I think the last scene that was still quite punk was the early '90s. This idea that every band could sell records and survive; there was not this fear that today you can feel in musicians. There was more freedom. I'm constantly trying to avoid that feeling, and a lot of decisions have been made trying to push away this feeling of fear: 'No, we won't do this.' And once you do it once, you realize it didn't affect your career, and it's alright. The more you do that, the more you grow." Explaining that it's artists, not labels, who find an audience, she continues, "Usually people in interviews are like, 'Matador brought to the world these amazing bands.' But no, the bands brought themselves there. I think that's part of our generation. Young people of our age don't want to be told what to do, because everything fell down. The elder generation can't tell us how to do things because they don't know how to do it... But I believe that the people who have the solution are the people that had to face a lot of failure. Once you fall and you're still here, you've learned a lot. And that's where we're coming from." Silence Yourself is out now on Matador Records/Pop Noire. As previously reported, the band return to North America for a tour next month. You can see all the dates here. You can also read Exclaim! 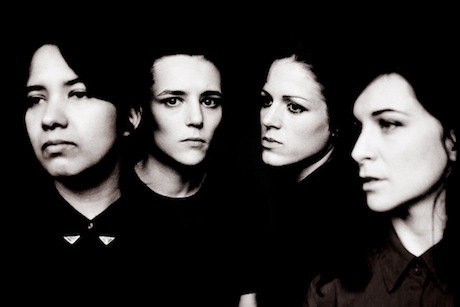 's recent feature on Savages here.